These bars are a fabulous peanut butter and popcorn spin on traditional crispy rice treats! Melt the butter in a large saucepan over medium-low heat until melted. Add the marshmallows and stir until completely melted. Add the peanut butter and stir until it is melted and thoroughly combined with the marshmallow mixture. Add the popcorn and quickly stir to coat all of the popcorn. 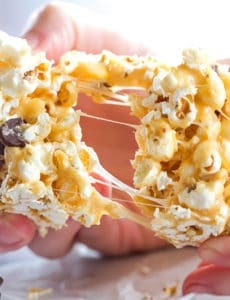 Turn the popcorn mixture out into the prepared pan and sprinkle with the chocolate chips. Using a spatula or wooden spoon coated in non-stick cooking spray, press into a compact, even layer. Allow to sit at room temperature until set, about 1 hour. Cut into bars and serve. Leftovers can be stored in an airtight container at room temperature for up to 4 days.